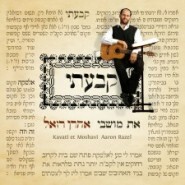 This beautiful song is dedicated to his wife (and my dear learning partner) Efrat’s grandfather, Saba Yosef. Its words are taken from the Book of Psalms: “Blessed is the Lord who has not taken my prayer and His kindness from me.” When I first heard it, it sounded like such a simple song. But in a letter that Aaron wrote explaining the song, he reveals that its message is in fact deeper than deep. It’s an encapsulation of Saba Yosef’s life; a life overflowing with faith despite unfathomable suffering and loss. I merited to develop a special connection with Saba Yosef when I got engaged to Efrat, his granddaughter. Yosef Bar came from Komarna, next to Lvov. He was an old-time Jew from that world that was destroyed. On the eve of Passover 1941 the Soviet Army came to draft him. His mother’s tears and begging didn’t do any good. His family thought that this was the end, and that they would never see him again. After a short time, the Nazis, yemach shemam, captured Komarna from the Soviets and murdered all of the Jews in the surrounding forests. And so, in Hashem’s kindness to Saba Yosef, he was one of the lone survivors from his entire town. But it would take 5 years until Saba Yosef discovered that that Passover Eve enlistment which he couldn’t escape with all the tears and begging in the world was what had saved his life. 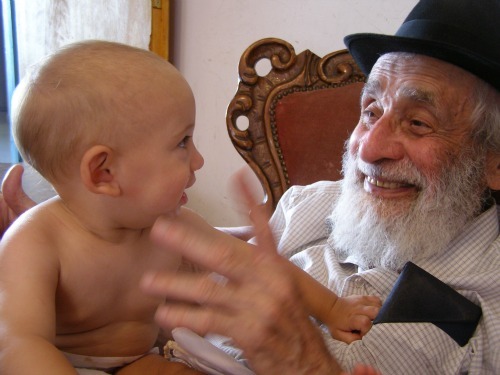 Saba Yosef never forgot his faith even after he had lost his entire immediate and extended family. He accepted his fate and his salvation from the Nazi’s hands with humility and simplicity. And he never forgot his Torah. He was an old-time Agudat Yisrael-nik with a HaModiah newspaper in hand and an open sefer at all times. Even at his nursing home he taught a daily class in gemara. From the first time I met Saba Yosef I felt the need to make him happy and to learn what I could from him. He would teach me the old melodies which he still remembered. I would learn some Yiddish from him, a little Torah or gemara and eat a rugelach from the old Geva Bakery where he would always buy something tasty so that he would have what to serve the grandchildren who came to visit. beautiful! where can i buy this cd? I agree with you this song is just beautiful and haunting.